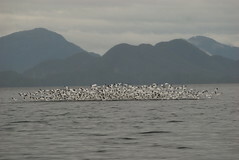 In the fall, the skies, lands and waters of the Great Bear Rainforest teem with marine and coastal birds. While some will overwinter here, many millions are in the midst of a major migration south. This event is underway as we cruise south down Principe Channel aboard our vessel Achiever; snow geese fly past with their powerful wings pumping and their brilliant white bodies straining against a strong southerly wind. Pacific loons and surf scoters blur by and distant flocks of other unidentified geese fly past in loose ‘V’ high above. Common murres and rhinoceros auklets sit in the choppy seas around us, before upending themselves with a flash of white to swim away under the sea. Seagulls swirl in our wake, investigating our potential, before peeling away with plaintive cries. Ahead on the water, I see hundreds of snow geese settling together in a single, densely packed group. Although we are not close nor on a direct course, the geese are skittish; at some signal they leap into the air and the sky becomes a blizzard of wings. They continue south down the long narrow channel. I see them for quite some time, strung out in loose lines that contrast white against the blue mountains and nearly disappear against the fresh snow on the peaks. In the water I find a single black-tipped feather as their only trace. We follow their path and enter Nepean Sound. With the sun sinking in the sky, my ruminations about geese are ended by an ominous sight. 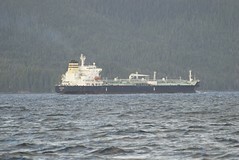 Following the same route of the snow geese down Principe Channel, an oil/chemical tanker materializes out of the haze. Transiting the sound, it heads east to Douglas Channel and Kitimat where it will unload its cargo – tens of thousands of tons of the hydrocarbon product, naptha – load it onto rail cars, and head for the oil pipelines of Alberta. The tanker Risanger, navigates through Nepean Sound on October 7th carrying its load of naptha, a form of condensate used in Alberta's oil industry. There is a moratorium in place here; not only for oil and gas development, but also for oil tankers in coastal waters. Yet somehow these tankers have been given tacit permission to repeatedly transit their dangerous cargo through this jagged, labyrinthine coastline. Worse still, there are plans for pipelines to bring crude oil from Alberta’s tar sands to the coast, for loading onto supertankers leaving Kitimat at an estimated pace of 2-3 per week. And it is not just oil, it’s an energy goldrush that threatens the coast; plans for wind farms, micro-hydro and natural gas pipelines are all in the works for the Great Bear Rainforest. We need to stop and consider what’s at stake. If enacted, many of these projects will have profound environmental and social effects. Without a doubt, there will be oil and chemical spills, both catastrophic and chronic. There will be conflict with fragile ecosystems, including already threatened species and populations. And still more, there will be consequences that we cannot yet begin to comprehend. As the sun sets, the tanker and small flocks of snow geese that still fly overhead begin to fade. The air grows colder and we spend the night, as black as crude oil, in the heart of the Great Bear Rainforest.